When I first moved to Seattle and didn't know where any malls were, I somehow figured out how to get on I-5 south and head down to this place. It's a nice-sized mall, and I remember doing all of my 1995 Christmas shopping there. This mall was originally called South Center. 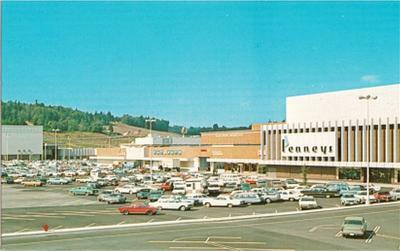 Not sure which year it opened but opened after historic sister mall of Northgate to the north. All Westfields who buys out malls change then to "Shoppingtowns" So originak name was South Center. Another famous mall was Sea Tac mall I think becuase it had a live gorilla. The "Shoppingtown" moniker was placed on numerous malls across the country when Westfield decided to market its U.S. malls under a "national" brand. The company, based in Australia, had labeled its malls in that country as "Shoppingtowns" for decades -- alas, the term never caught on in the U.S., and the company recently announced plans to drop the "Shoppingtown" moniker at its U.S. malls altogether. Mitch brings good news, if it plays out like that. For most of my life I grew up literally in the shadow of Trumbull Shopping Park just north of Bridgeport CT (owned and operated by Frouge Corporation). When Westfield unceremoniously decided a few years ago to rechristen it Westfield Shoppingtown Trumbull, it was like part of my childhood died. I was kind of bummed when I discovered that Topanga Plaza in Canoga Park CA had received a similar "adopted name" from its new owners. the B and I in Tacoma had Ivan the Gorilla who is now in Atlanta. SeaTac is in FederalWay is now the Commons. South Center was built in 1968. I was working for my uncle that summer and did some surveying for the parking lot. Typical of Westfield is to used the Westfield Shoppington name in front of the mall. Similar procedure to the malls they acquired in Olympia and Vancouver Washington. 2008 marks the 40th anniversary of the mall. The postcard photo will no longer look that way at all from the south side of the mall. 2 parking garages, a 16 screen AMC theater, a food court with a large window to view Mt. Rainier from, and two floors of shopping (80 stores are to be added) will be the largest addition to the mall and will make it the largest mall in the Northwest. 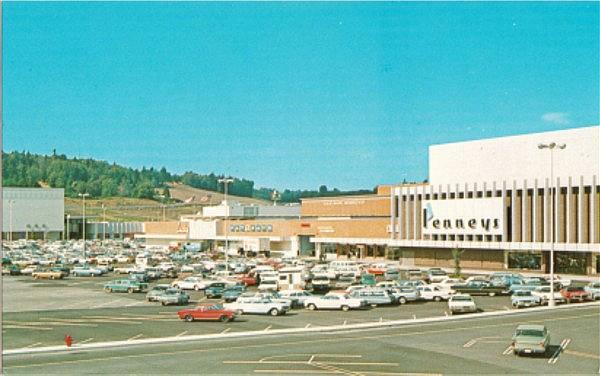 I read an article in the Seattle Post Intelligencer serveral years ago that stated when Southcenter opened in July of 1968 it was the largest mall west of the Mississippi. Maybe that explains why there were lots of cars from other states I spotted in the lot during my younger days. I have shopped in that mall most of the time it has been opened and it is my favorite one to shop at. Even though I live in Tacoma and shop at Tacoma Mall (which had a similiar design to Southcenter in the beginning). Anyone remember the original commercials for Southcenter featuring a very young Sandy Hill from KIRO Eyewitness News standing next to a Rolls? Of course, the jingle went something like, "Southcenter, 100 stores, and all that room...Southcenter, it's ALWAYS a beautiful day!" Does anyone else remember Stanley's shoes in the 1970s...during the Disco era?